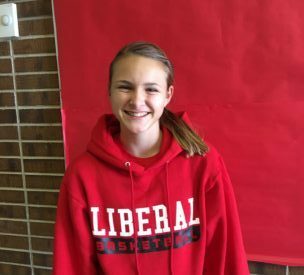 Liberal freshman point guard Katie Horyna is Mead Lumber Athlete of the Week. Horyna was named to the all tournament team at the Salina Invitational last weekend. Horyna scored 11 in Liberal’s 47-41 win over Abilene in Salina last week and dropped in eight against Salina Central. She is Liberal’s leader in assists helping them to a 10-2 record and a #10 ranking in 5A. She is also an excellent runner and placed seventh at the state cross country meet. She will run track and field in the spring. Horyna and LHS faces 12-0 #1 class 3A Hugoton Friday night at 6:30 with Redskin Pre-game at 6:15 on 1270 and kscbnews.net.